It’s almost hard to imagine, but it was only 17 months ago that Kodak was faced with having to shut down its film manufacturing plant in Rochester, New York and close the doors on filmmakers’ ability to shoot on film. With its main competitor Fuji having already been driven out of the celluloid business, Kodak’s film sales dropped 96% in less than eight years. In the summer of 2014, the company was about to accept defeat at the hands of the digital revolution. Kodak was only able to stave off bankruptcy through a series of secretive last-minute negotiations, which resulted in Hollywood studios promising to buy a guaranteed amount of film stock every year. The studio bosses were driven to make a large financial commitment to Kodak by a group of passionate A-list directors — Christopher Nolan, Martin Scorsese, Judd Apatow, Quentin Tarantino, Edgar Wright, Bennett Miller and, most importantly, the filmmaker charged with re-booting the “Star Wars” franchise: J.J. Abrams. However, the biggest feather in Kodak’s cap is the “Star Wars: The Force Awakens,” not simply because it is one of the most highly anticipated movies in years, but because Abrams is returning the franchise to film after its founder George Lucas leveraged its power to accelerate and usher in an era of digital filmmaking. 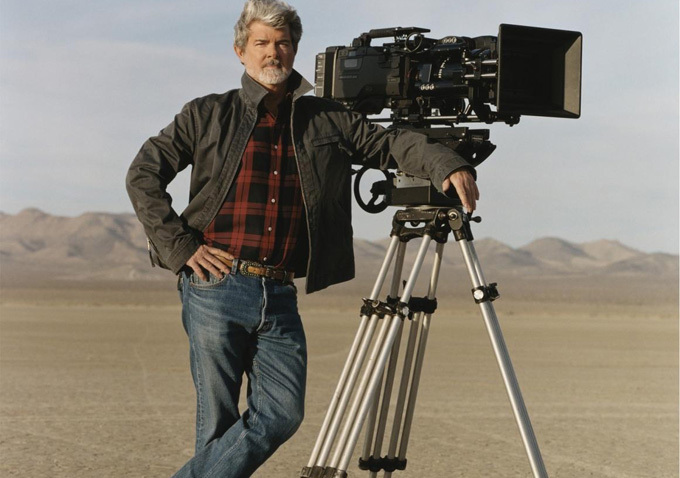 After reigniting the “Star Wars” mania in 1999 with the phenomenal success of “Star Wars: Episode I – The Phantom Menace,” Lucas was determined to make 2002’s “Episode II – Attack of the Clones” the first Hollywood film to be shot digitally, going so far as to twist the arms of two of the biggest camera manufacturers into building him the camera he needed. Lucas was not simply just a believer in digital cinematography, but its biggest proselytizer. The filmmaker was known for holding filmmaker summits at his Skywalker Ranch, where he would try to convince virtually every major director in Hollywood of the malleability and “painterly” qualities of digital imagery, while at the same time chastising filmmakers — like “Breaking Bad” creator Vince Gilligan — for still shooting on film. One of the next generation filmmakers who was unconvinced by Lucas was Abrams, who strongly believed the “Star Wars” reboot should be shot on celluloid. “J.J. has talked extensively about choosing film for the ‘The Force Awakens,’ and mentioned that because the movie has so many effects, he didn’t want audiences to ‘get lost in a world of synthetic,'” Andrew Evenski, Kodak’s President of Entertainment and Commercial Films, told Indiewire in an interview this week. As director Alex Ross Perry wrote for Indiewire last month, one of the biggest hurdles of shooting film is debunking the myth that it is unaffordable. Evenski agrees, arguing that the discipline of shooting on film makes it completely possible to budget for the format. The current wave of blockbusters and Oscar hopefuls shot on film does not appear to be an anomaly, but rather the start of a trend. According Evenski, the list of 2016 releases shot on film is a long one. Among the upcoming titles: Zack Snyder’s “Batman v. Superman: Dawn of Justice,” the Coen brothers’ “Hail Caesar!,” David Ayer’s “Suicide Squad,” Damien Chazelle’s “La La Land,” Patty Jenkins’ “Wonder Woman,” Paul Greengrass’ “Bourne” sequel, Antoine Fuqua’s “The Magnificent Seven,” Colin Trevorrow’s “The Book of Henry,” along with new projects from indie stalwarts Joe Swanberg, Jeff Nichols and Kelly Reichardt. In other words, the conversations surrounding the future of the format aren’t going away anytime soon.